We didn’t really have plans for Saturday on our whirlwind trip to the east side of the state. 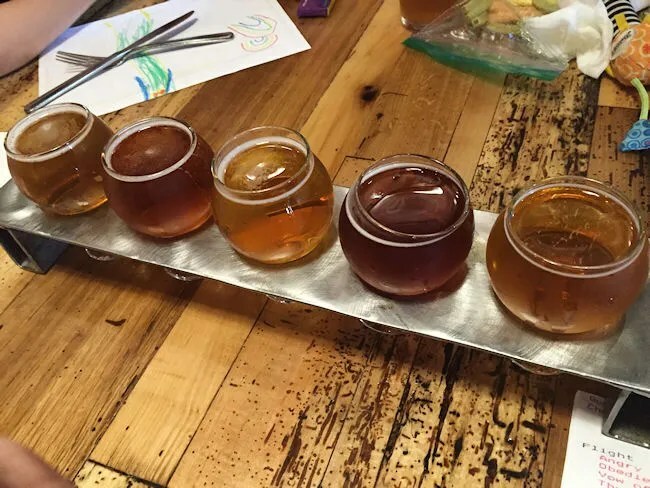 As I mentioned previously, we stayed the night Auburn Hills mostly because we didn’t want to put the kids through six hours in the car just so mommy and daddy could taste some delicious hard cider. J got up with the kids on Saturday morning and went to the breakfast at our hotel. I took the opportunity to grab another half hour or so of sleep. We checked out of the hotel around 11:00 and headed towards home. Our neighborhood picnic was that night and we wanted to at least get home for the bike parade. It’s really cute. The fire department brings down one of their engines and leads the kids around the neighborhood on their bikes. L doesn’t really like her bike, but loves her scooter, so she scooted the whole four blocks or so they did pumping that little leg as hard as she could to keep up with the bigger kids. As we were coming in to Flint on I-75, J asked if there was any place to eat. I told her to Google “brewery” and see what came up. What she got was….not much. Tenacity Brewing was all that came up. There was no food menu and they weren’t open yet, so that wasn’t an option. At that point, I said either Google something else or try “Brewery” in Lansing. She chose brewery in Lansing. 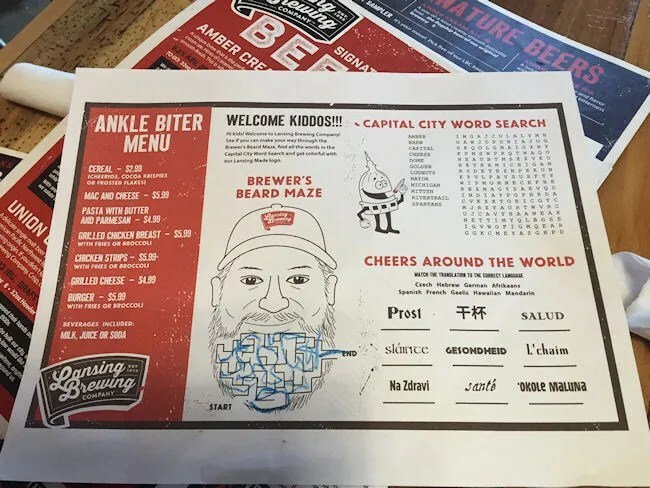 The first thing that popped up was Lansing Brewing Company. 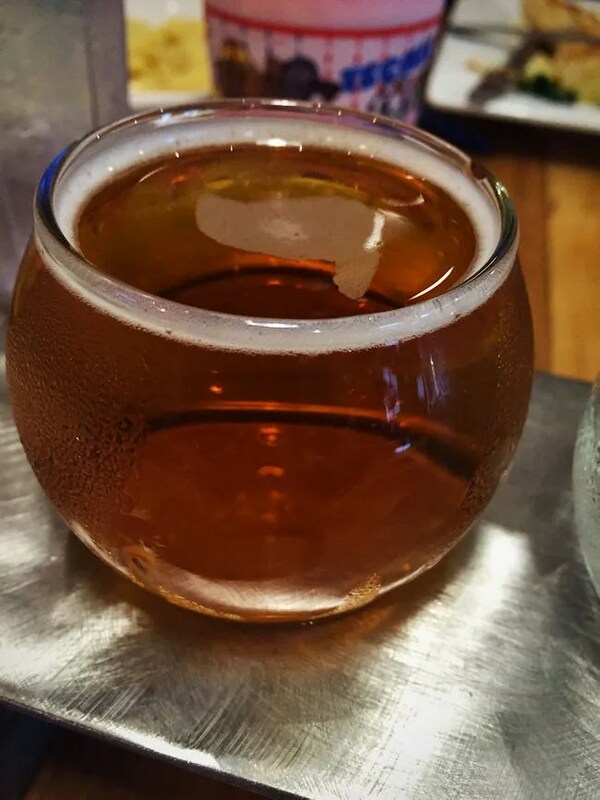 It’s been six years since J and I lived in Lansing and the only brewery at that time was MBC…which is now not Michigan Brewing Company but Midtown Brewing Company after Michigan Brewing went bankrupt several years back. Finding that there are now multiple breweries in town was a little bit of a surprise. 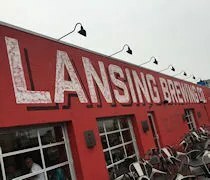 Lansing Brewing Company is near the corner of Shiawassee and Larch in downtown Lansing. The building used to be Mid-Michigan Stamps and Signs…so not even remotely something used in the hospitality industry. The building was turned into a brewery in 2015 at the cost of more than $1.5 million. Lansing Brewing Company traces it’s lineage back to the 1890’s. You see all over the building and on their website Est. 1898. 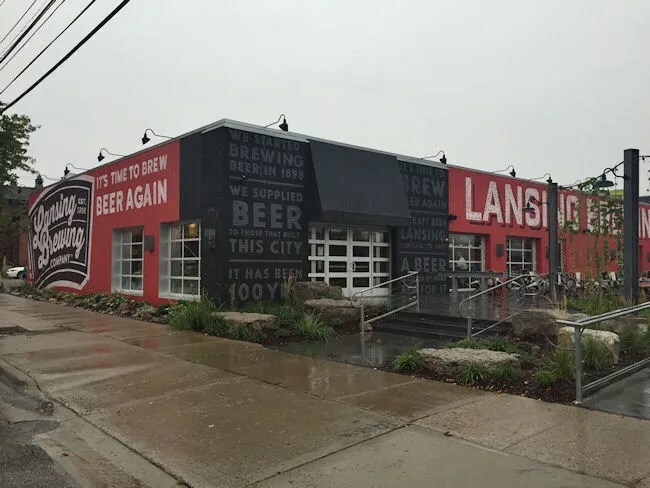 The original Lansing Brewing fell victim to prohibition in 1914. 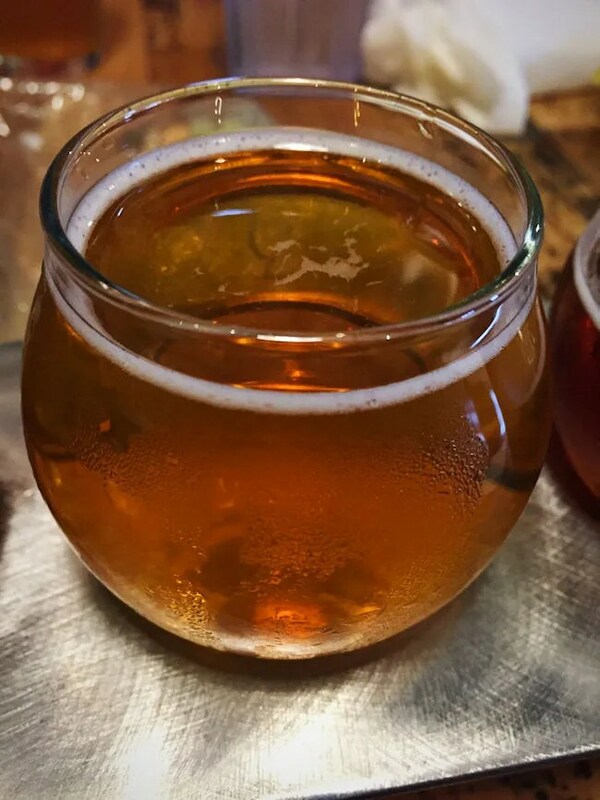 The rights to the name were secured by the new owners in 2013 and they claim direct heritage to the original operation even using the original Amber Cream Ale recipe. We pulled into the large parking lot of Shiawassee just after noon on a Saturday. It was raining so we all ran to the door which opens into a massive restaurant space. The building is really kind of long and narrow and they use all of that space for seating. At first, we were shocked just how many people were there then quickly realized the Michigan Democrat State Convention was taking place at the Lansing Center which accounted for about half of the people in the restaurant at that time. The four of us were shown to a table in the main dining space near the back of the bar. Our hostess grabbed a high chair for B and a kids menu for L while she got J and I set up with drink menus and their amazing food menu. I wasn’t going to do it, but I felt I had no choice after looking over the beer list. I had to get a flight. The first beer I had still makes me laugh. It’s called Angry Mayor IPA. Lansingites will get the humor in the name. Lansing Mayor (and former Gubernatorial candidate) Virg Bernero was called, by TV pundits, the “Angriest Mayor in America” when he was on Fox News and defended the auto industry in 2010. Now, they’ve named a beer after him and even the art work looks a little like the mayor. The beer itself is pretty good. It’s an American IPA that isn’t too bitter and has just a little hint of citrus. 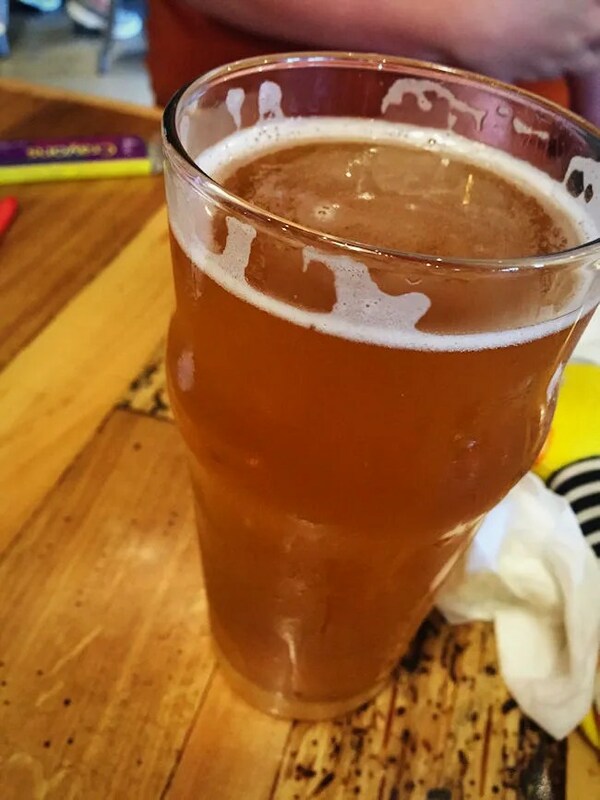 It’s a very drinkable IPA, but doesn’t have a flavor that makes it truly memorable. It’s one of those beers I could drink a lot of and never get tired of it. Beer number two was Vow of Obedience. The beer is a Belgian Dubbel. Very earthy with a malty sweetness. Dubbel’s can be hit or miss with me. 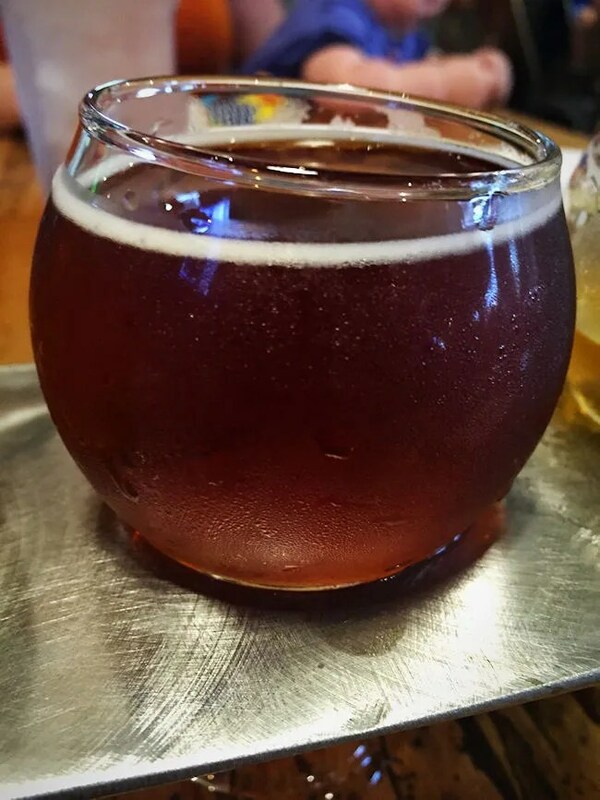 I don’t know what I like in a good Dubbel and I don’t know what I don’t like in a bad one. Maybe it’s just the mood I’m in…I don’t know. But I did enjoy this one although I’m not sure if I would have enjoyed more than the small taste I got in the flight. 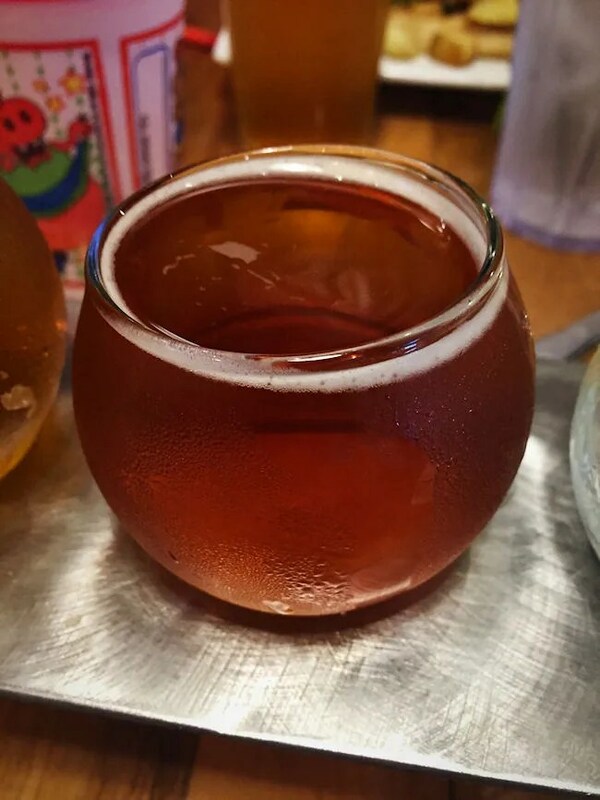 The third beer was Vow of Silence. They call it both a Belgian Tripel and a Blonde High Gravity Ale. Whatever it is, it was actually really tasty. If you haven’t figured me out yet, I like really boozy, in-your-face kind of things when I’m doing flights. I got that with Vow of Silence. Beer number four was The Hermit Old Ale. Another beer I really liked. Some old ales can really be overpowering with the sweetness, but this one did it right. The last beer was by far my favorite and the one I wish I would have taken a crowler of home. Epic Luponic is a Triple IPA. Remember when I said I like in-your-face beers? Yeah. This one is that. It almost stings when you drink it…kinda like a good whiskey. The waiter told me to save that one until last or I’d blow my taste buds. He was right. It was strong, but strong and delicious. J ordered herself Urban Grove. This is a Pale Wheat Ale. She’s used to drinking Oberon in this style and said it would have benefited from an orange slice. I took a couple of sips and thought she was pretty spot on. A little more citrus flavor would have helped, but it was still a very drinkable beer. So many things to choose from. My gut was screaming at me, “Get the Lucy Blue. Get the Lucy Blue!” When it came time to order, my brain said, “I’ll have the Be Still My Heart BBQ Burger.” Both my brain and my gut choices would have been delicious, so I couldn’t lose either way. 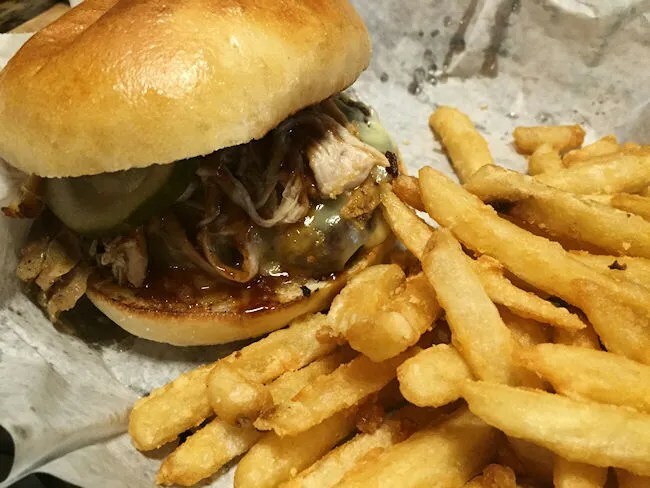 The Be Still My Heart BBQ Burger is a 1/2 lb burger that has been char-grilled and topped with pork that has been braised in the Union Golden Ale, aged Gouda, pickles, and an Amber Cream BBQ sauce. The sandwich was so tasty. The burger got a little lost in the shuffle as the pork really dominated the flavor. That was OK. The pork was very tender and very flavorful after being braised in delicious, delicious beer. The sandwich was served on a toasted bun alongside beer battered french fries that B and I shared. J did something completely out of left field. I saw it on the menu, but man was I surprised she ordered the Chicken and Waffles….and I am soooooo glad she did. 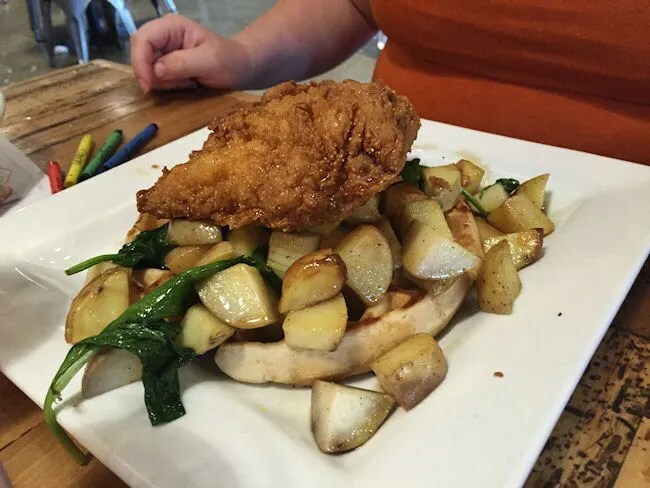 The plate is a Belgian waffle topped with Yukon potato hash and a pickle-brined fried chicken breast. 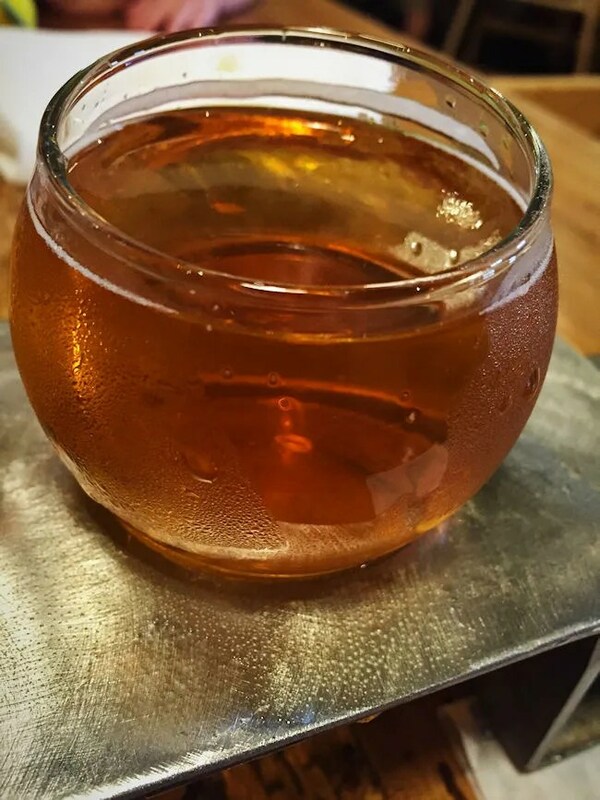 The whole creation is topped with a Hard Nose Rye Whiskey infused maple syrup and ho. ly. crap! That syrup was so amazing. The sweet of the maple syrup and the nose twitching whiskey were absolutely amazing together. It didn’t matter if we were eating it on the chicken, the waffle, or the potatoes. It made everything it touched taste amazing. J was so happy with this choice polishing off the potatoes and chicken then using the waffle to soak up every last bit of the syrup. There is no children’s menu on the website, but they do have one in house. 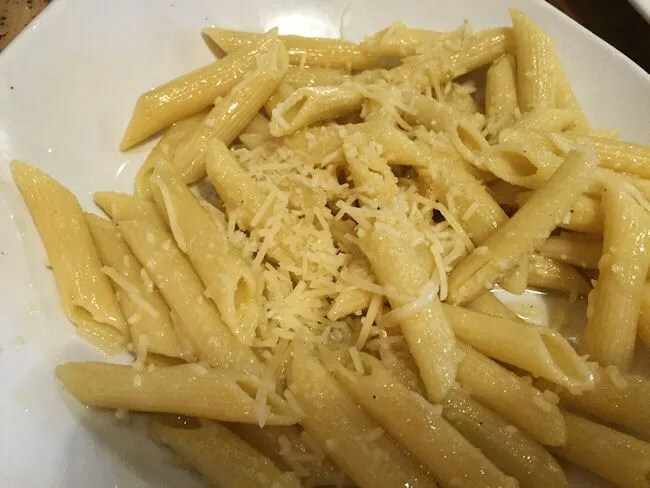 L selected the pasta with butter and Parmesan cheese. It was a pretty large portion for a kid and L ate some of it. J and I kept sticking our forks in the bowl and helping her because even that was delicious. It’s definitely not something that you would expect on a kid’s menu. Our bill, before tip, was around $45. Boy, I can’t say enough good about Lansing Brewing Company. The food was delicious. The beers were delicious. The space is amazing. The atmosphere is great. These kind of places didn’t exist when we lived in Lansing. 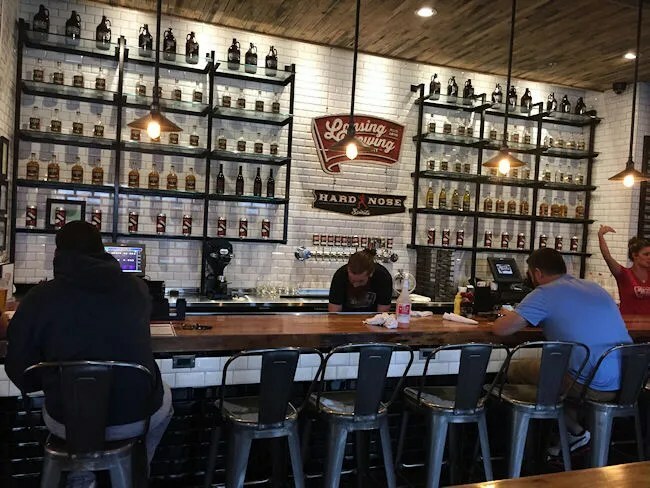 Downtown is growing and changing for the better and Lansing Brewing Company is a place that needs to exist in the state capital.